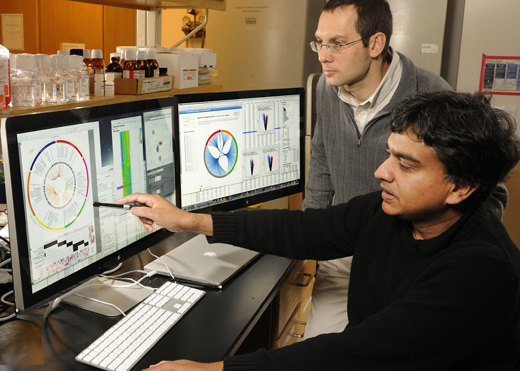 Research discoveries by Bali Pulendran (seated) and colleagues point to possible new treatment strategies for inflammatory bowel diseases and autoimmune diseases in humans. Intestinal inflammation in mice can be dampened by subjecting them briefly to a diet restricted in amino acids, the building blocks of proteins, research published in Nature shows. The findings, made by Bali Pulendran and colleagues at Emory University, highlight an ancient connection between cellular mechanisms to sense nutrient availability and control of inflammation. They also suggest that a low protein diet – or drugs that mimic its effects on immune cells – could be tools for the treatment of inflammatory bowel diseases, such as Crohn’s disease or ulcerative colitis. This protective effect was shown to be mediated by a molecule known as GCN2, which is highly conserved from yeasts to man, and which is a critical sensor of amino acid starvation in cells. The finding grew out of the Emory team’s earlier discovery that GCN2 is pivotal for induction of immunity to the yellow fever vaccine. The research was supported by the National Institute of Allergy and Infectious Diseases (R37 AI048638, U19 AI090023, U19 AI057266), the National Institute of Diabetes and Digestive and Kidney Diseases (R37 DK057665), the NIH Director’s Office of Research Infrastructure Programs (Primate centers: P51OD1132), and the Bill & Melinda Gates Foundation.